Dimensions: 7.3" x 1.3" x 1.3"
COM-100 TDS Water Meter is a handheld waterproof EC/TDS/Temp Combo Meter. Ideal for all water quality testing, water purification applications, wastewater regulation, aquaculture, hydroponics, colloidal silver, labs & scientific testing, pools & spas, ecology testing, boilers & cooling towers, water treatment and more. 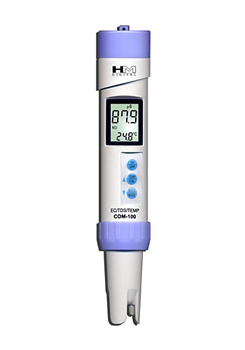 This Electronic Water Tester measures Total Dissolved Solids(TDS) and Temperature with high precision. The COM-100 is a professional level EC/TDS meter at an unbeatable price. Measures electrical conductivity(EC), total dissolved solids(TDS), salinity and temperature. UPGRADED: Four scales: µS, mS, ppm, ppt(mS and ppt are new). Automatic Temperature Compensation(ATC) using three temperature coefficients. Push button digital calibration to any point within the meter's range. 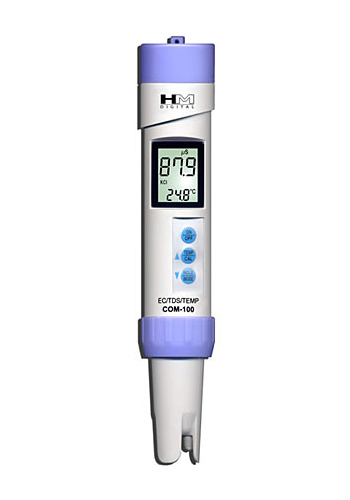 Large and easy-to-read LCD screen includes simultaneous temperature reading. Pre-programmed, non-linear conversions for KCl, 442 or NaCl solutions, selected by the user. Automatic (ATC) with three temperature coefficients. Digital calibration by push button. - Meter is shipped with the default reading in EC using the KCl temperature coefficient and the temperature reading in Celsius. - HM Digital TDS meters come factory calibrated and are ready to use. They are designed to stay consistent. However, after prolonged usage, it may help to recalibrate your meter using a commercial standard NaCl-based solution, which is approximately, 0.5 µS of conductivity. - Factory Calibrated: The COM-100 meter is calibrated with a 1413 µS solution. The meter can be recalibrated with digital calibration using the push buttons, rather than a screwdriver. - Includes a cap, batteries and lanyard.